Thanks for the meditation paper, soz. Exactly the sort of thing I'm looking for. I'm gonna give it a once-over in the next few days before I post any more thoughts. As to amphetamines, the "racing thoughts" phenomena has been my experience but amphetamines are prescribed for ADHD (Adderal being the most obvious) to help with attention. It's because of that that I'm wondering if perhaps at doses lower than a normal "recreational level" in a brain that is not contending with ADHD, maybe a slight bump in norepinephrine might help focus attention without the unwanted speed-y side-effects. Gnosomai Emauton wrote: - Norepinephrine is most responsible for vigilant concentration thus, to map it to Great Work type paradigms, would be the chemical we are trying to naturally increase through practices of Raja Yoga. soz wrote: It presents empirical data that shows that norepinephrine production is decreased during meditation. Amphetamine use actually increases the concentration of norepinephrine in the brain and blood. Thanks guys for keeping this thread alive and not letting it fall victim to the True Scientist's uneducated blatherings. He seems like he tries to bury real scientific information for a misinformation agenda like an episode of the 700 Club. So, yes. Norepinephrine is a chemical that "binds" communication/synapses in the brain. This is where the combination happens. Norephinephrine is partly responsible for concentration -- but it is only an aspect of it. We need to qualify what type of meditation. And this is where we get into more "passive/inhibitive" types (asana) - reduced limbic system byproducts and then more "active/excitatory" types (bhakti) - increased limbic system byproducts. Quieting the mind is very attentive, but as the study shows, the limbic system (norepinephrine) is suppressed. These are the chemicals involved with emotions, FWIW. I believe we start to suppress the norepinephrine and start to engage the acetylcholine (dream chemical) when we go into certain deep meditative states. Which is why I think the AIM model that was shared earlier is so important. In any event, norepinephrine helps to bond the thoughtforms together - we can recall faster because it strengthens the synaptic highway (neural pathways) that happen when something is "perceived" or "thought of" or "brought to mind." They help to create the memory - which is why it is hard to recall dreams for most people (because their "attention" chemicals are very polarized). It is the "glue" that fastens the memory or "image" to the brain. So, it is involved in vigilant concentration, but to say it is the only component would be not exactly accurate. Long story short, we aim to control the CNS (central nervous system) and the prefrontal cortex - the executive/rational function, what we WANT (WILL) TO BRING TO MIND, but in order to do this, we need to obtain control over the FUEL (the passion behind the Union - to starve it and feed it at will, basically reprogram it) - SNS and the PSNS (the older parts of the brain mentioned earlier - sympathetic and parasympathetic nervous system) - which are directly wired to the limbic system (adrenal/norepinephrine is part of this system). Funny how the more reptilian parts of the brain is the snake that needs to be tamed? The Nechesh is also the Messiach! (358). Isn't the so-called Kundalini a serpent as well? These are the watery reflexions of the three enthusiasms; those of Apollo, Dionysus, and Aphrodite. The whole star is Nechesh and Messiach, the name "AHIH" joined with "YHVH". And once these chemicals can be controlled, we can dose ourselves with norepinephrine (and other neurotransmitters) in conjunction with USEFUL thoughtforms (a chosen aspect of Nuit) at will. Willed neuroplasticity or brain change via chemicals. It seems to break it into more dharana (FA) and samadhi (NDA). One sees difference, the other there is "no difference" between inside/outside, within/without, intrinsic/extrinsic. What does this mean to meditation? And what happens when we start to put these chemicals together with fixed attention? But, the best part is, if we focus on certain thoughtforms (possibly in Liber O), with this increased chemical flow, what begins to happen to the mind-body? Especially if it is willing the neuroplasticity (brain growth) in certain directions? Eventually, I'd like to share my findings with brainwaves and electromagnetic fields when these inhibitive/excitatory practices are introduced. They are measurable and you're absolutely right -- We are starting to amass data regarding them. I personally guarantee that two-way communication via information fields (including electromagnetic fields outside the body) will be proven in our lifetime scientifically. I'd love to keep this conversation going on scientific lines and not unintelligent rhetoric...thanks again for the dialogue. The association of those chemicals with the three Alchemical qualities would be a big piece toward arguing that psychological archetypes stem from a biological source. I don't know if I'm only stating the obvious or what. But it goes quickly to the universality of the Cube of Space in the human psyche, one tradition of interpreting and idealizing its archetypes being expressed in the trumps of the tarot. As to the chemical association, it could answer the question of how and why the archetypes of the human unconscious do seem to be universal enough to argue for a collective human unconscious. I had previously only been relating them to the sympathetic, parasympathetic, and central nervous systems. This seems an even more concrete link. Am I assuming too much correlation between the nervous systems and the chemicals presented? Legis wrote: The association of those chemicals with the three Alchemical qualities would be a big piece toward arguing that psychological archetypes stem from a biological source. Absolutely. I think that psychological archetypes stem from a biological source, but the DNA is pliable in the way it reacts to the environment. Neuroplasticity provides proof that we're plastic psychologically/physiologically/anatomically. Epigenetics shows that we are pliable genetically. 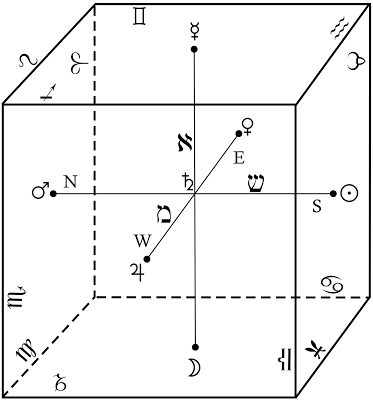 (I) - Input - Internal/External gating of phenomena - I attribute this to the Mars/Sun axis - Mars being where the "Universal Will" (Geburah) meets the individual "Will" (the Sun). (M) - This is the overall Modulation between waking and sleeping states - Mercury/Moon - Mercury being Air and the rational mind/the Lunar consciousness being represented by the Moon. So the Cube of Space is laid out a bit differently than the AIM model - you have to rotate it a bit - but you can see what I mean. It's was a fun exercise to put these two models together. What do you think? Where would you put the attributions? Legis wrote: As to the chemical association, it could answer the question of how and why the archetypes of the human unconscious do seem to be universal enough to argue for a collective human unconscious. I agree with this. There is a universality to how the chemicals directly affect the mind-body "objectively," which can be measured quantitatively through experiment and data collection. Also, it can map the human consciousness individually with what chemicals correspond with which neurobiological states ("energies" or even "spirits" when we consider it collectively) - possibly even with currently accepted collective consciousness states like mob psychology and memes. How do you think it could help answer the questions? I feel like you have more to say about this...I'd like to hear it. Yes, I think so. Because they are so interrelated, it is hard to isolate the processes to just the CNS and the ANS alone. I think we can break it down further to the neurotransmitters, chemicals, and combinations thereof. Also, the brain states have so much to do with the consciousness taking place, which directly influences perception, the reaction to the "environment," and subsequent brain/epigenetic change. I've decided to post it here because I like the way this thread is evolving. I also really like this interconnected web that's forming between various live threads and am excited to see how further questioning of "everything you think you know" will mutate the discussion in the future. A thread on alchemical neuro-chemistry. Quantum telepathy. Gravitational levitation. Anywho... I decided to finish reading Timothy Leary's Info-Psychology before the end of the year and Cosmic Coincidence Control Center decided to throw me one last curve-ball before we put this arbitrarily-decided 365-day revolution to bed. Near the end of the book, as he's discussing the speculative possibility of atomic intelligence, he quotes at length from some un-attributed source by Nick Herbert. For anyone who doesn't know, Herbert is one of a group of "hard scientists" who, along with Elizabeth Raucher, George Weissmann, Jack Sarfatti, Saul-Paul Sirag and others, were the Fundamental Fysiks Group, founded at Berkeley National Laboratory in the 70s. Basically, this was a think-tank of some of the best and the brightest (and turned-on) to discuss the philosophical possibilities and ramifications of quantum theory. Additionally, as I discovered while trying to track down the source of the quote, Herbert is from Pittsburgh... where I grew up. Nick Herbert wrote: Some ideas of the essential strangeness which underlies the quantum level is provided by the recent theorem due to J. S. Bell's theorem which says, essentially, that if quantum mechanics gives correct results, the subquantum world must be "non-local"--connected together in an intimate way in an instantaneous web of relationships. In this view, once two particles have interacted, they are in some sense connected forever on the subquantum level... Once we have interacted with something or someone, are we forever connected to them? What does Bell's theorem have to say about psychometry, about the interpenetration and "stickiness" of personalities? Should we guard our hair and nail clippings against magical misuse by enemy sorcerers? How can we experimentally foster these strange linkages; what is the relative effectiveness of palmistry, massage, sexual union in increasing Bell-type interconnectedness? How about sitting together in a hot tub?... It may be that for reasons similar to those advanced against a hidden-variable theory of consciousness that Bell's astonishing theorem does not play any part at all in human affairs... The unflinching contemplation of what Bell's theorem really has to tell us about separateness may act as a kind of spiritual exercise to bring about a similar delocalized state in the mind/world of individual scientists. For those who come to understand it, Bell's theorem can act as a powerful image reminding us of Nature's ability to casually surpass our naive notions of what must be so. Thank you all for some great and challenging discussions this year. I wish each of you wonderful figments of my digital imagination, another trip around Ra that is full of non-local interpenetration and overflowing with magical "coincidences". Frater 639 wrote: Funny how the more reptilian parts of the brain is the snake that needs to be tamed? The Nechesh is also the Messiach! (358). Isn't the so-called Kundalini a serpent as well? Great thoughts for future meditation. Also, the paper that soz posted offered some really good/clear insights into the parallels between "normal" brain function and the functions created by the addition of specific psychedelic/narcotic substances (i.e. specifically which receptor sites are affected and which natural brain chemicals they relate to). I knew that the tryptamines were cognates to typical neurotransmitters but it was a surprise to me to find that our brains produce an opiod that is naturally found working the neural pathways. My quick google search to teach myself what acetylcholine is pointed out that it works the same receptor sites as deadly nightshade and amanita muscaria. I haven't yet acquired a copy of 776 1/2 but, if there isn't yet a column for naturally occurring neurotransmitters... it looks like one might be building itself here. Yes. There isn't one yet. We can definitely take brain waves and apply the elements to them as well. I think Crowley would have been all over it. Part of my research involves subtle energy fields (using a method not unlike the study here) and correlating brain states using an EEG. I then experiment with invocation and chart the brain and subsequent energy fields. I saw this article and thought of you since you seem interested in remote communication. In the following journal's context, the "communication" is healing. This study is very well researched and is credible enough to be referenced in many medical studies.